Veteran Owned, Family Owned, Christian Owned. Conveniently located on the Medina River, just minutes south of downtown San Antonio. Family owned and operated, we are dedicated to making your stay enjoyable and memorable. Alamo River RV Ranch and Campground is an ideal base camp to explore San Antonio and the beautiful surrounding Texas Hill Country. Stay with us as you enjoy the many area events and attractions like the San Antonio Stock Show & Rodeo, Fiesta, or one of the many other cultural events. Our friendly staff will help you plan your adventures and provide directions, information, and even brochures to assist you. We are within 30 minutes from most San Antonio attractions including the Alamo & the River Walk, Lackland AFB, SeaWorld, Fort Sam Houston, Six Flags Fiesta Texas, SA Stock Show, and more. Please call our office at 1-800-RV-Ranch or 210-622-5022 to make reservations and allow us to help personalize your experience at our ranch. We would be happy to answer any questions you may have. 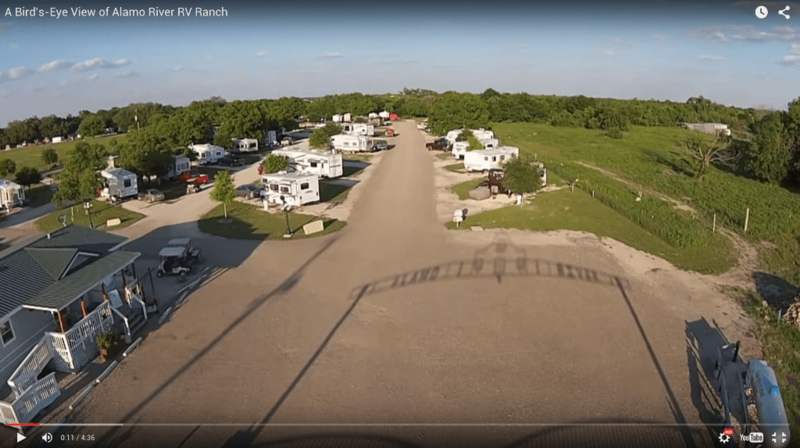 Although Alamo River Resort is a big place, nearly 100 acres, the amount of RV, Cabin and Camping spaces are limited. Because of this, we do tend to stay pretty full. Giving us a call is always the fastest and best way to get answers. 1 800/RV Ranch or 210/622-5022 will get our office between 8AM and 6 PM central time when we are in front of the computer. When you contact us please indicate what kind of accommodations you will need. We have so many to choose from so be as specific as you can about your needs. Dates are very important, when will you be coming to the Alamo City and for how long? Will you need a RV space with full hook up? RV space down by the river with water only? RV space in the pop up spaces, which have only water and 20/30 amp electricity? Length of your rig, tow vehicle, number of slides, 20/30/50 amp service and if you would prefer to have a standard or premium site. This is information that will help us serve you better. Our horse accommodations down by the river have water nearby but no electricity so running your own generator is fine. If you prefer your 4-legged friend be in one of our horse stalls and you desire to stay in a cabin or RV site please let us know that too. Like the airlines, the earlier you are able to book your reservations, the more money we can save you so please let us know early, especially for those holidays when you can expect everybody to be booked. If you like to fish, then Alamo River RV Ranch and Campground is the perfect place to snag a whopper! We have over a mile of shoreline along the Medina River. More than 25 species of fish, including catfish, bass, and carp, make the Medina their home. Many a real-life fish story has come true along our banks. We offer day passes for those coming to fish for just a day, as well as primitive tent and RV camping along the river. Please verify that you are a human - Thanks!